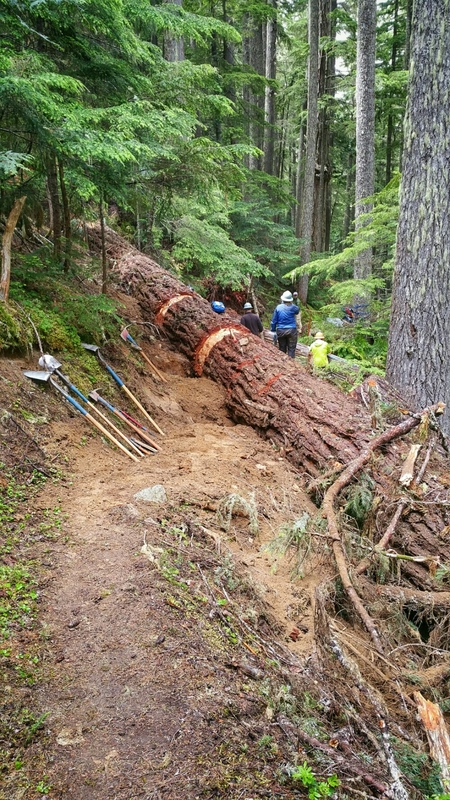 During our week in the Glacier Peak Wilderness clearing trees, our goal was to clear three trees during our five workdays. Anything beyond that was gravy. When we heard that, we wondered what we had got ourselves into. That and the thought seemed a bit silly. Until we walked up to the first two trees, some 2.5 miles uphill from camp. That’s me, standing in the middle of what was the tread of the Pacific Crest Trail. 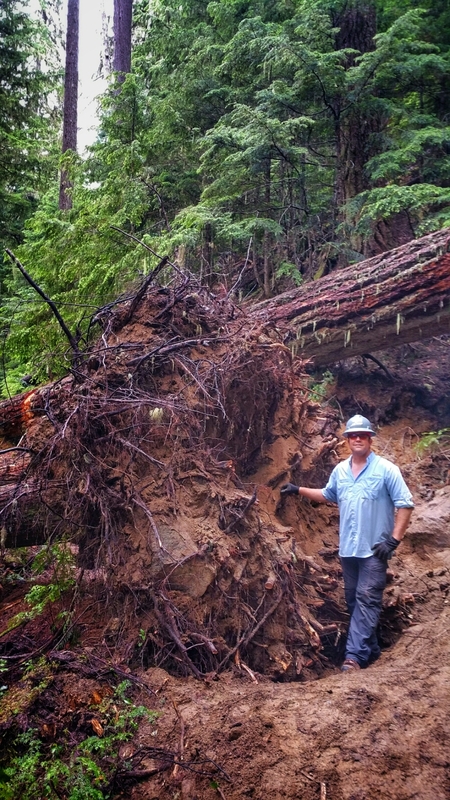 That massive fir tree lying on its side in the background fell in high winds, splintering some 8-10′ off the ground and falling towards the trail. It appeared to have clipped the cedar on its way down, causing the cedar to fall. 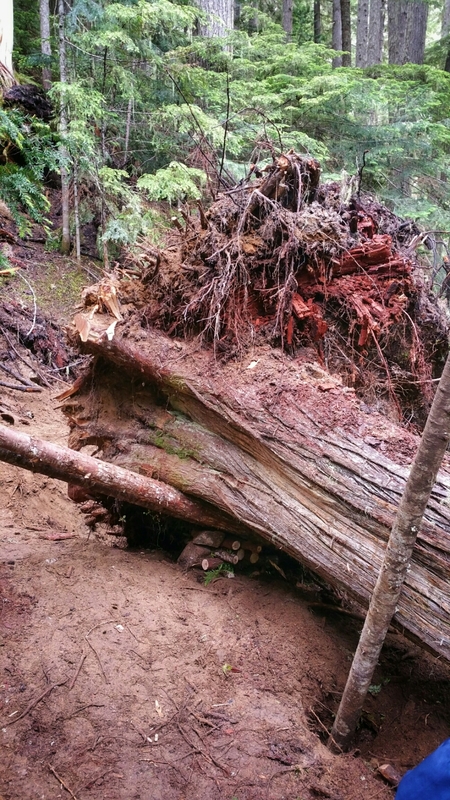 The cedar’s rootball undercut the trail, so when it fell, it ripped up the trail with it. 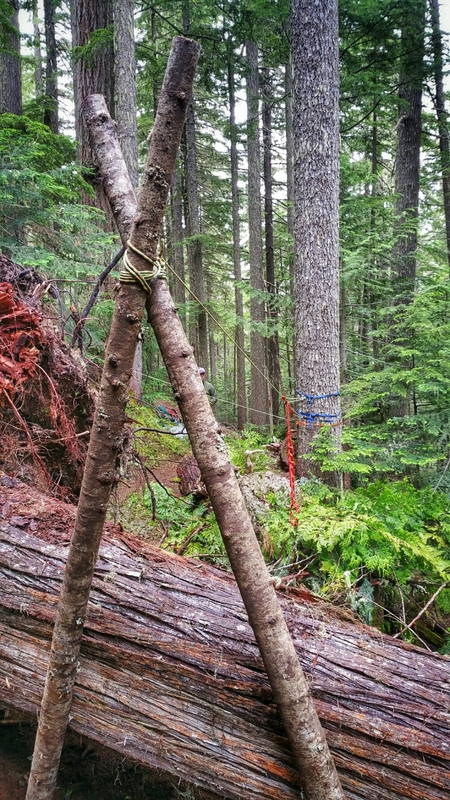 Some 40′ up trail, the massive fir lay across the trail, trapped against other trees and blocking the trail. This was our job for what would be three full days of work for seven people. 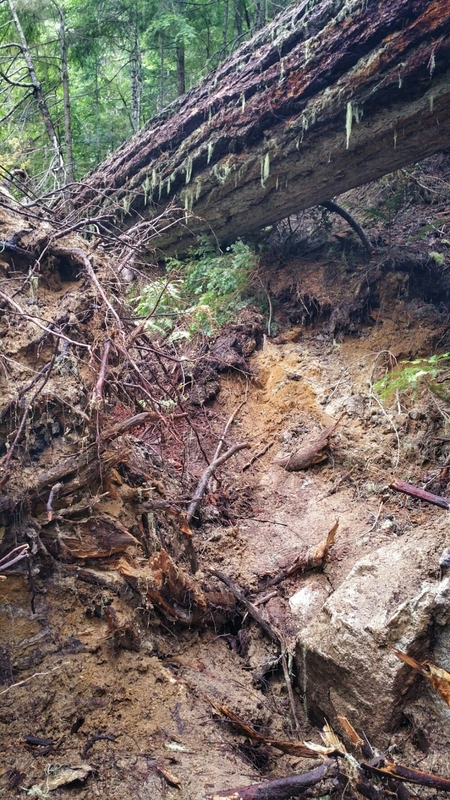 Hikers had made their way around the root ball. 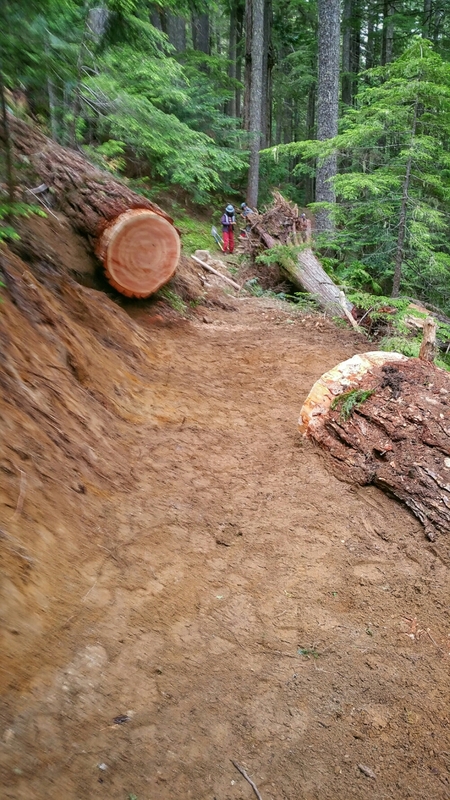 Our initial thought was to trim thr root ball and reroute the trail around it. 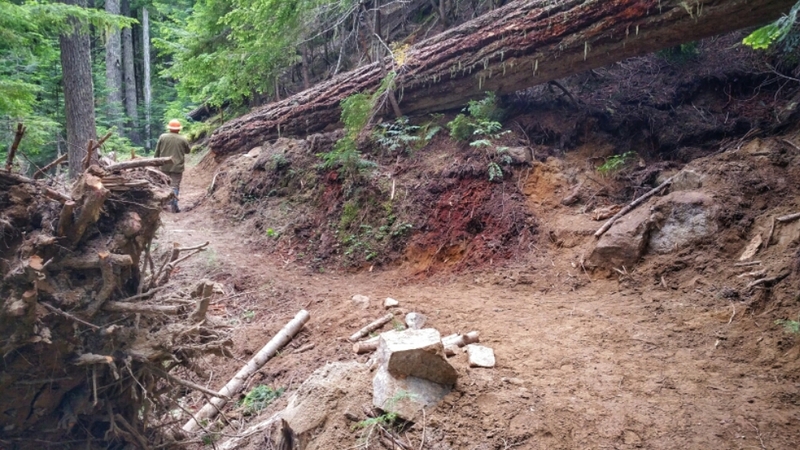 But that massive rock on the right would have been right in the middle of the trail, still making it impassive for equestrians and pack animals. So the trees had to go. I didn’t document the remainder of the day, mainly because the battery on my phone died right after taking those two pictures. But we were busy, too. We trimmed and trimmed and trimmed the root ball, cleared as much dirt and rocks as we could from between the roots and dug and dug and dug, trying to sever the remaining roots that were still in the ground. Day 2 saw more of the same, including some prep work on the massive fir tree. That work included debarking and digging access channels for the old crosscut saw that we would be using. The root ball trimmed and cleaned, ready to roll. The lever would be joined with several others to help us roll the root ball down the hill once we cut the trunk so that the root ball was free. Also, we had a little bit of mechanical help. Our crew leader happened to be an engineer with a rock climbing background. So ropes, harnesses and logs were put to use. Even with these advantages, once we started, it still took all seven of us the better part of 2 hours to roll the ball down the slope. Levering a few degrees, a few inches at a time, adjusting leverage and push points, then a few more degrees and inches. Finally, with our strength rapidly evaporating, we got that last big rotation, enough that everyone had that big surge of adrenaline, keeping the momentum going and sending the root ball rolling a few feet down the slope. Two full days complete, except for the 2.5 mile hike downhill to camp. The third day meant that we had the big fir to clear. We expected it to take all day to make the three necessary cuts. That was the right call. Making the tree look like a porcupine. 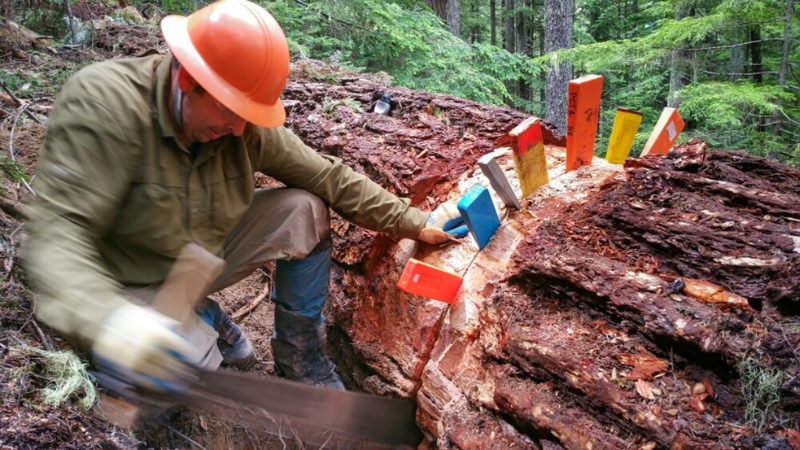 Keeping the saw moving, even in the least ergonomic positions. 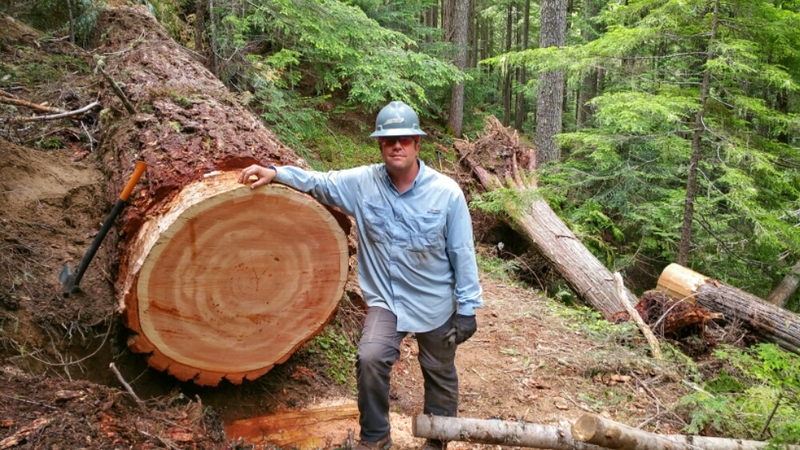 Seven people, three cuts, all day, to clear a 43″ circumference tree. You can see the cleared cedar tree in the background. Looking down trail after the trees were cleared and the trail rebuilt. And finally, looking up trail. Note the boulder to the right, which was in the middle of the impromptu trail in the second picture above. 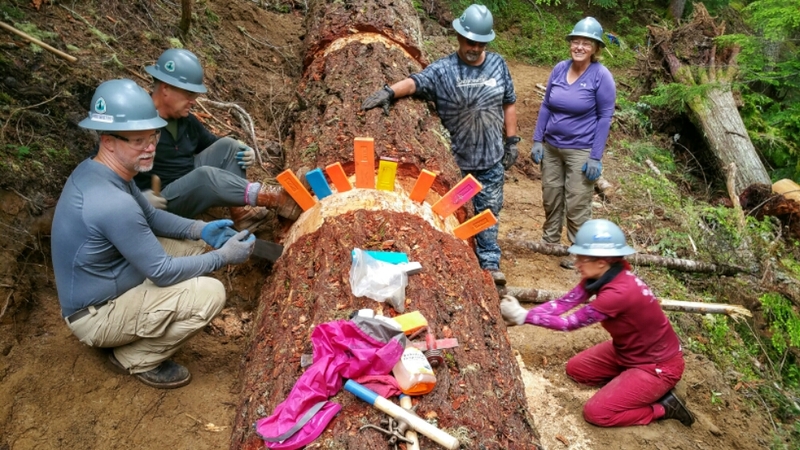 Seven people, all volunteers from different walks of life, taking three days to clear tons of deadfall, turning an absolute mess into a passable, clear trail for hikers and equestrians. A great way to spend three days. Wow! It looks great. Thank you. WOW!! That is totally amazing! They sure grow ’em big up there it Washington. You guys really did an outstanding job! They sure are big! That means more time on the saw!